While many universal gadgets claim to do it all, the udoq 400 universal docking station is true to its word and does it well. It’s universal because it works with all devices and all brands. If your house is divided between Android and Apple, no problem. Even if some have tablets and others have smartphones, no problem. You can even connect udoq to your computer, your original chargers or an additional multi-port USB charger. You customize the aluminum base to your household’s specific needs. There are four size cases to choose from: udoq 250, 9.8-inches; udoq 400, 15.7-inches; udoq 550, 21.6-inches; and udoq 700, 27.5-inches. What makes the building process easy is that you don’t have to choose the size until you put in the devices to charge. Drop down menus on udoq.com let you choose your brand, device and model. After each choice an animated version builds your charging base showing how much room you have left until the next model is needed. 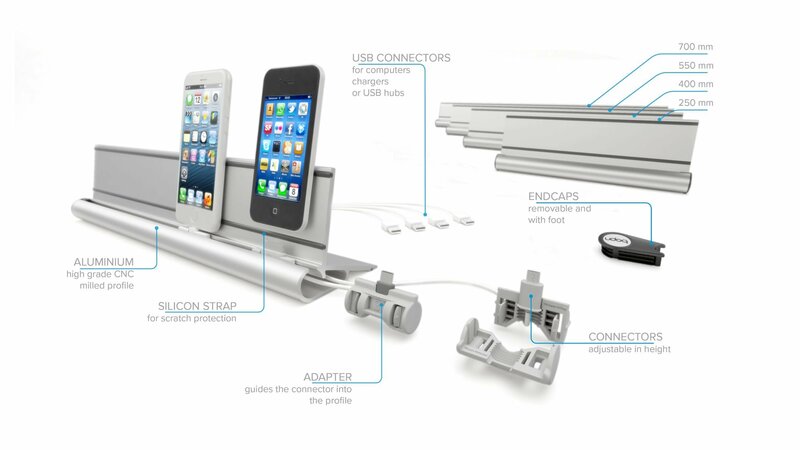 Devices are charged independently with udoq bumpers that hold the connector cable for that device. The cables snake through the back of the dock and then you just attach the power adapter, sold separately. I tried my udoq 400 with my own USB power hub and it worked perfectly. A 6-port charger is a reasonable $25.90. After unpacking my demo unit udoq 400, I saw how easy this really is. Simple and space saving after the two tablets and two smartphones in my house were charged on one space-saving and good looking desktop dock. Preconfigured versions of the charging docks are available for Apple (iPhone, iPad and even Apple watch) and Android. Devices must be charged in portrait mode, which doesn’t bother me. I just thought it was worth noting. A wall mounting kit ($44.90) and Qi wireless adapter ($25.90) are available. The bases start at $89 and go up to $159 before you configure it with the charing devices connections. Honeywell recently went live with pre-orders and special pricing for its new do-it-yourself smart home security system. The easy-to-use system allows users to self-monitor their home or office with real-time security updates via the Honeywell Home app, and integrates Amazon’s Alexa voice assistant, with a simple customizable setup. The 1080p HD camera base station features certain Alexa capabilities, a high-quality speaker, microphone, 145-degree viewing and night vision. Add-on components are available to enable wireless features and battery-powered indoor/outdoor motion viewers that send a video clip when motion is detected. Door and window access sensors, and a key fob will also be available. The current pre-order pricing bundles include a Super Smart Home Security Bundle for $599.00 (MSRP: $808.94) and buy a starter kit and get a free Honeywell C1 Camera for $449.00 (MSRP: $568.99). You get free 24 hour video/image clip storage and additional plans are available for up to 3,000 clips for 60 days for $149.99 annually.